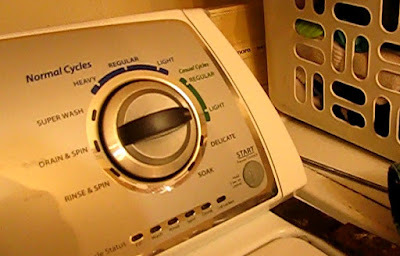 A 2011-made Whirlpool washer (model WTW4930XWO) left our clothes wet, failing to fully drain and spin them out. Once it ended a wash attempt with the tub full of water. At the end of a wash cycle, the "spin" LED was lit instead of "done." These late model top-load washers, know as "vertical modular" machines in the industry, are computer controlled. Some Kenmore and Maytag nameplates also may be very similar. The post is split into four sections that can be used independently of each other. First is how to check the drain pump for obstructions; second is how to use the on-board diagnostic tool; third is how to troubleshoot the control board with a meter and the fourth is how to replace the control board. Or it can be read as an entertaining narrative. Thanks for having a look and I hope it helps. 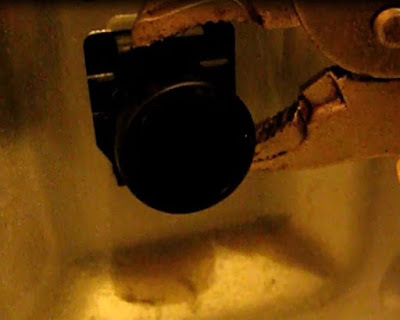 The problem began after the backing on a bathroom rug fell apart in the washer, so I naturally thought the drain pump or sump was plugged up with small pieces of the rug. Let's take this apart and check for blockage. 1) Unplug the machine and shut off the water valves. Pull it off the wall far enough to access the back cover. 2) Drain the water out of the machine. Pull the drain hose out of the wall drain pipe and empty into a catch pan. I found the drain hose fit into my shop vac hose (in wet mode) and I sucked the water out that way. 3) Remove and check the drain hose. First place a catch pan under there in case water remains in the tub and drain line. A vice grip pliers works well for this. Remove the clamp and pull it off the drain fitting; Check the hose for obstructions. It's not a bad idea to flush it out with a garden hose. 4) Remove the six 1/4" hex head sheet metal screws holding the back cover. There is also a small plate on the upper left that must be removed (one 1/4" screw). 5) Remove the clamped on end of the inner hose from the back cover. Squeeze it with a pliers and push it inward. 6) Remove the back cover and set it out of the way. 7) The pump is now visible. 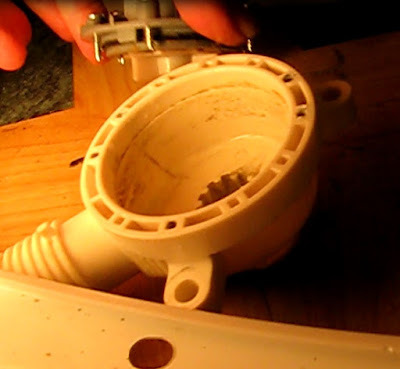 If desired, remove the short inner drain hose from the pump assembly. Depress the clamp and move it out of the way and pull off the hose. 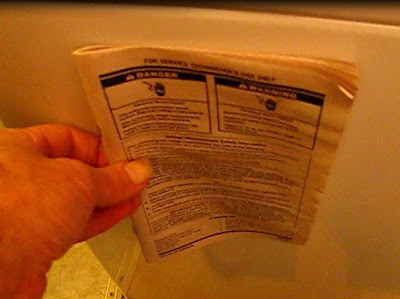 Check it for obstructions and not a bad idea to flush it with a garden hose or at the sink. 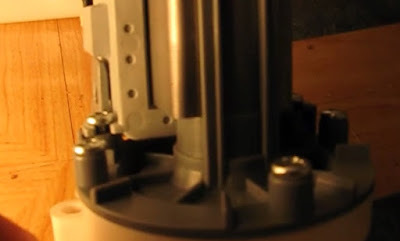 8) There are several ways to get a look inside the pump. There are 5 Philips head screws holding the pump to the sump above. These can be removed and the pump will drop down. Or do as I did and remove three 5/16" hex head screws holding the pump to the bottom of the drum. Two are visible and one is behind the pump and must be found by feel. 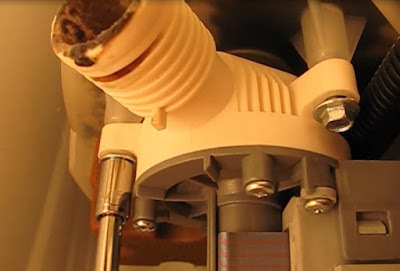 Support the pump to prevent it from hitting the floor when the last screw comes out. 9) Unscrew the pump from the sump and inspect. I found it very clean in there. The problem is elsewhere on this machine. Reassemble the pump and install. I opted to leave the back off to aid in troubleshooting later. This machine is computer controlled and has some on-board diagnostic features that utilize the cycle dial and LEDs to aid in troubleshooting. There is a service guide behind the front cover of the machine that details how to use this feature as well as troubleshoot components of the machine. 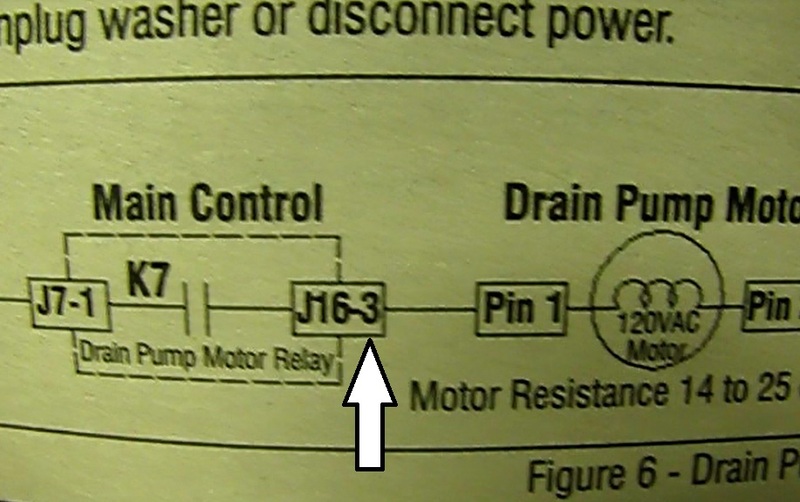 The steps outlined below are clearly explained in the technician's repair guide that is packed inside the machine. 1) Put the machine into diagnostic mode. All LEDs should be off. The following dial turns must be completed quickly, in under 6 seconds. Turn the cycle dial counterclockwise any number of clicks. Then turn it clockwise three clicks, counterclockwise one click and then clockwise one click. If done correctly, all LEDs (except "lid lock") should be flashing together. 2) Manually test the drain pump. We are already suspicious of the drain pump circuit, so we are going to go right to the "manual mode." This will allow us to turn the drain pump on and off manually to pinpoint the problem part. 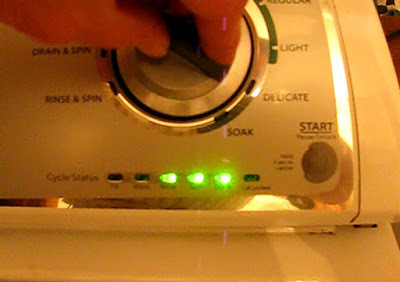 Also, the "spin" light being on at the end of wash cycle is itself a customer view-able fault code. It is indicates a "long drain fault." This occurs when the water level does not change despite 10 minutes in drain. This could also have been found in the "fault code display" diagnostic mode. 3) Select manual mode. 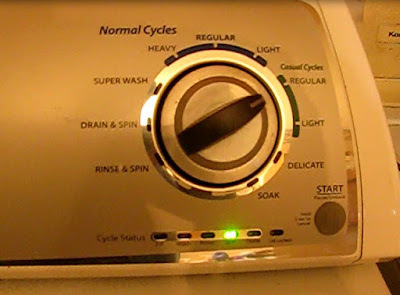 Turn the cycle dial a click at a time until the "spin" and "done" lights are on. That's just three clicks to get there. 4) Activate the manual mode. Simply hit the start button to activate. All LEDs will go off. 5) Go to the drain pump test mode. Rotate the dial clockwise until the "rinse," "spin" and "done" lights are on. That's seven clicks. 6) Run the pump. Press start and the three LEDs with flash and the pump will run...unless there is trouble in that circuit. We have trouble. On the very first try, it failed to come on. Then with more attempts, it did come on. This is consistent with what we saw when washing loads. Sometimes the pump would run and sometimes not. We need to get at the control board, the central hub of the machine to troubleshoot further. 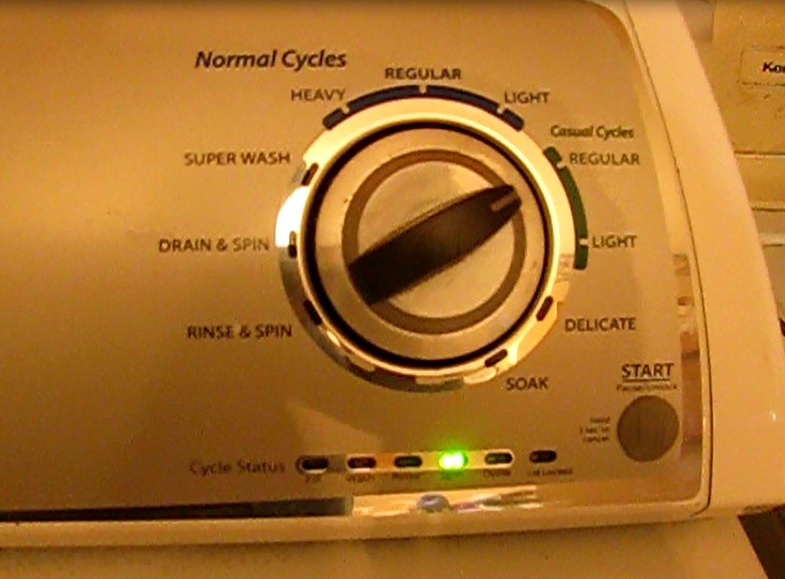 The control board is directly behind the cycle dial. The control console must be separated from the machine to get at it. Note: the live circuit troubleshooting depicted is only for demonstration purposes. It should only be attempted by persons trained to work safely on live 110VAC circuits. 2) Slip a putty knife between the surface of the machine and far end of the operator console. There is a spring catch under there. Feel for it with the putty knife. It will push back against the knife. Push in and lift to disengage the console. Repeat on the other side. 3) Remove a screw from each of the back corners of the console. 4) Lift the console up and lay it down on the top of the machine. 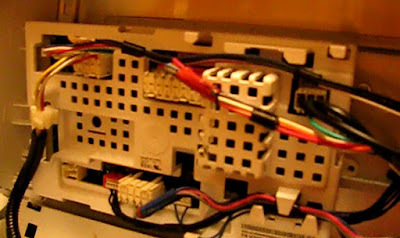 The control board is encased in a white plastic vented cover. 5) Plug the machine back in and put into diagnostics mode and then manual mode and turn on the pump. The LEDs are flashing but the pump is not running. 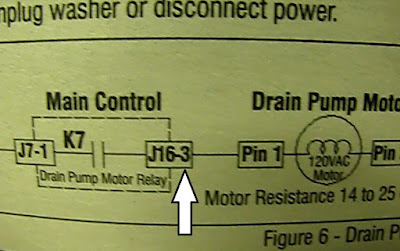 5) Troubleshoot the drain pump circuit. The easiest part to check first is the pump output of the control board. This is found at pin 3 of J16. This is the largest connector at the top of the board. When the drain pump is commanded to run, this output must go high (120V). With the negative meter lead at neutral (Pin 3 of connector J7) and positive at pin 3 of J16 we get no output voltage. The problem is on the control board. I considered replacing the relay but we needed this washer running quickly. I may attempt to get a relay at a later date in order to have a spare board. By no means is it certain that the relay is the problem. There are other possibilities, such as a power supply problem or even the microprocessor. The drain pump output of the control board. 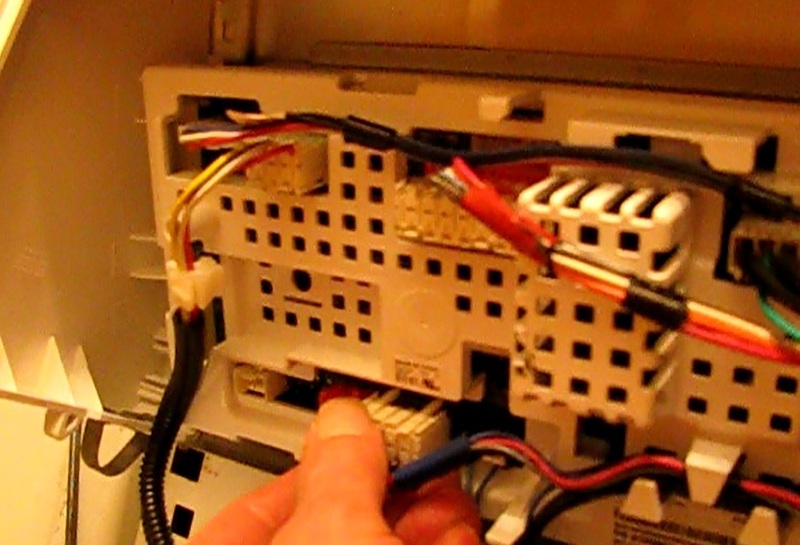 2) With the console separated from the body of the washer, unplug all connectors from the board. They all have locking latches that must be released and several of them are very tight in their sockets. Considerable rocking of the plug in the socket is needed while struggling to release two latches on several of these sharp edged rectangular plugs. Several have panel fasteners holding the wiring into position. These large plugs have double catches and are very tight...and sharp. Ouch! 3) Remove the board. First remove two screws holding down the board. Then lift the board up until the angle is high enough to allow a tab on one end to slip out of slot behind the console. 5) Install the board. Slip the tab into the slot and rotate down until flush with the console. Install the two mounting screws. Plug in the board and route the wires and seat the wiring fasteners. 6) Slip the console back over the back plate and rotate down into place until the spring clips snap into position. Install the two back corner screws. 7) Plug in the machine and turn on the water valves. 8) Do a small test load. Problem solved. This is easier and surely gives comfort to internet users about this Liquid Waste Removal topic. Thanks for sharing. Post like this offers great benefit. Thank you!